Backing up virtual machines, especially in large virtual environments with hundreds or even thousands of VMs, is a time-consuming process that imposes extra load on your VMware, Hyper-V, or AWS infrastructure and its critical components, such as network, hypervisor hosts, and, of course, datastores. If multiple VM backup jobs coincide in time, this can result in VM slowdown and other related issues. However, you can avoid the problem and reduce load on your resources by carefully scheduling the entirety of your VM backup jobs, while taking into account the average job duration, determining the most appropriate backup windows, and automating the scheduling process, whenever possible. 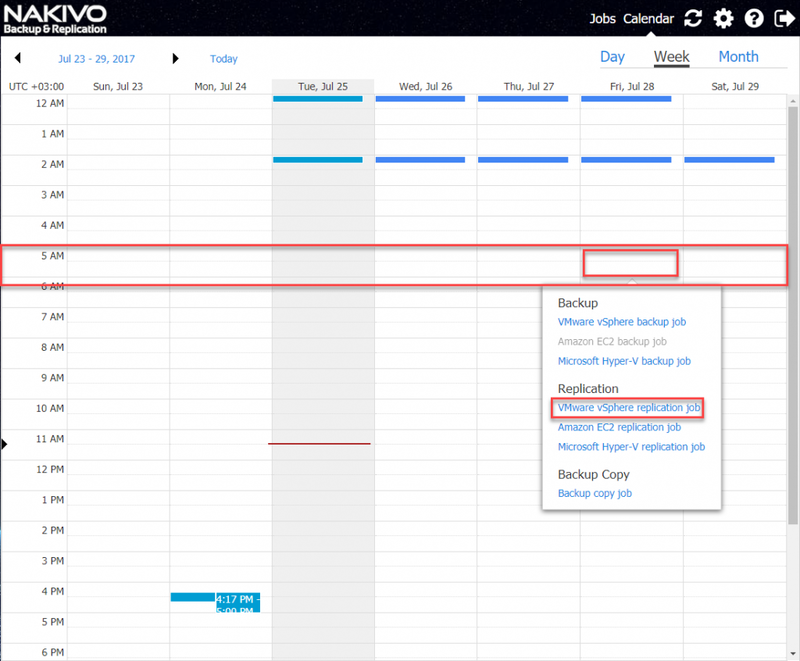 The most convenient way to schedule and structure your VM backup jobs is to use the Calendar Dashboard offered by NAKIVO Backup & Replication. Bird’s eye view on all of your past, present, and future VM backup/replication jobs. Also, the Calendar displays the length of your finished jobs and the predicted duration of your current and planned jobs. This allows you to instantly find the available backup windows and create new VM backup or VM replication jobs, while easily avoiding unnecessary schedule overlaps. Three viewing options. By default, the dashboard has a Week view. However, depending on your preference and needs you can also choose a Day, or Month view of your VM backup/replication jobs. Color coding of VM backup/replication jobs. Two options for creating and scheduling new jobs: right from the Calendar Dashboard and from the job wizard. Flexible Job Scheduler for extended control over your VM backup/replication processes. It allows you to run your jobs, for instance, in the nighttime on weekdays and in the daytime on weekends. 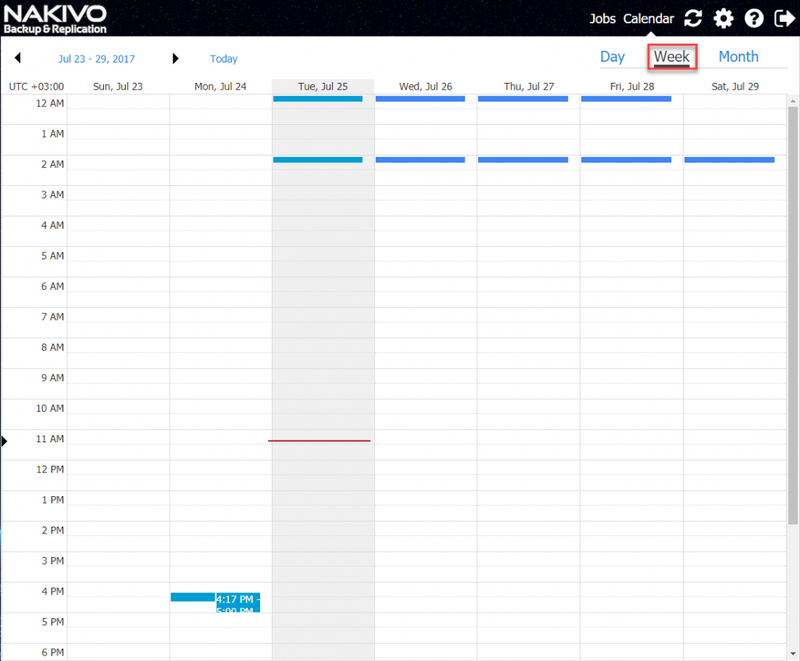 All the elements of the NAKIVO Backup & Replication Calendar Dashboard streamline the job scheduling process and save you lots of time and efforts. 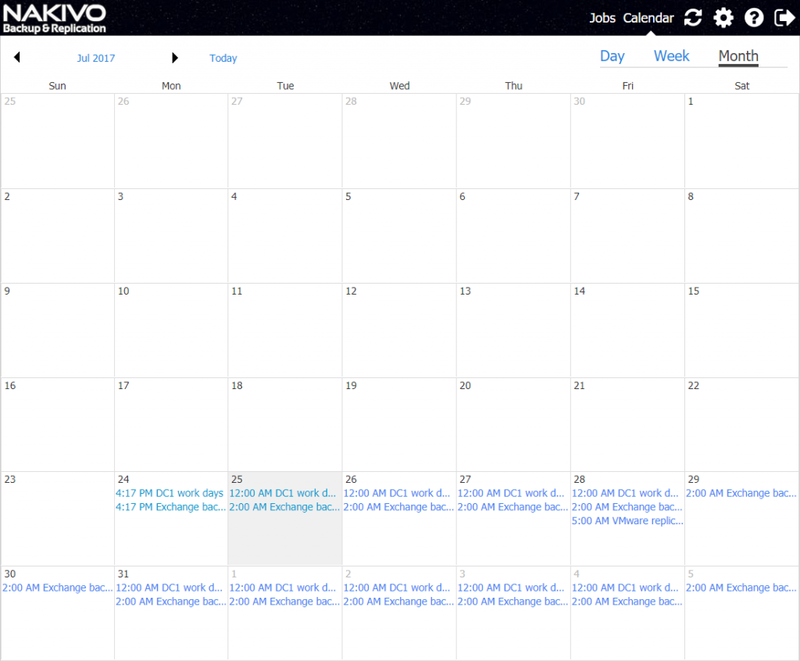 First, log in to NAKIVO Backup & Replication web interface and click Calendar to reach the Calendar Dashboard. In the Calendar Dashboard, you can see all the jobs scheduled for a specified period (this can be a day, a week, or a month). Click on the certain time of the day you want (in our case, it is 5 AM, Fri, Jul 28). Then select VMware vSphere replication job to create a new VMware vSphere replication job, or any other job type depending on your needs. 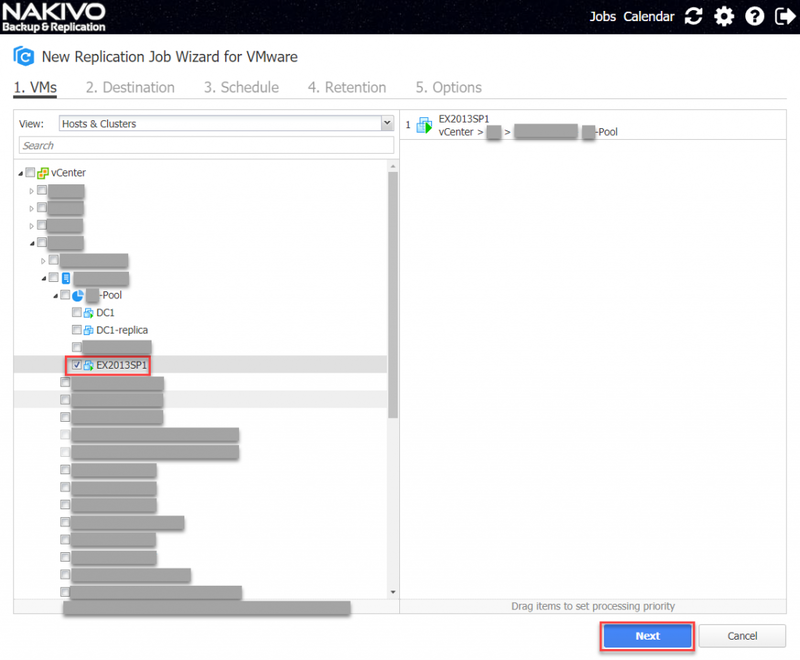 This action will open the New Replication Job Wizard for VMware. Select a VM for a job (in our case, it is EX2013SP1). Click Next. Choose a Destination for your job. Click Next. At the next step of the Wizard, – Schedule – you can see that the job is already scheduled to run at 5 AM daily/weekly. However, in our case, we decided to use another scenario and selected Run monthly/yearly from the drop-down list. So, as it was mentioned above, the job will run at 5 AM on every 28th day of each month. Click Next. At the next step of the Wizard, – Retention – leave everything as is. Click Next. At the final step of the Wizard, – Options – also leave everything as is. Click Finish. Go to the Calendar Dashboard to verify that you have just scheduled your job to run at the specific time and date. 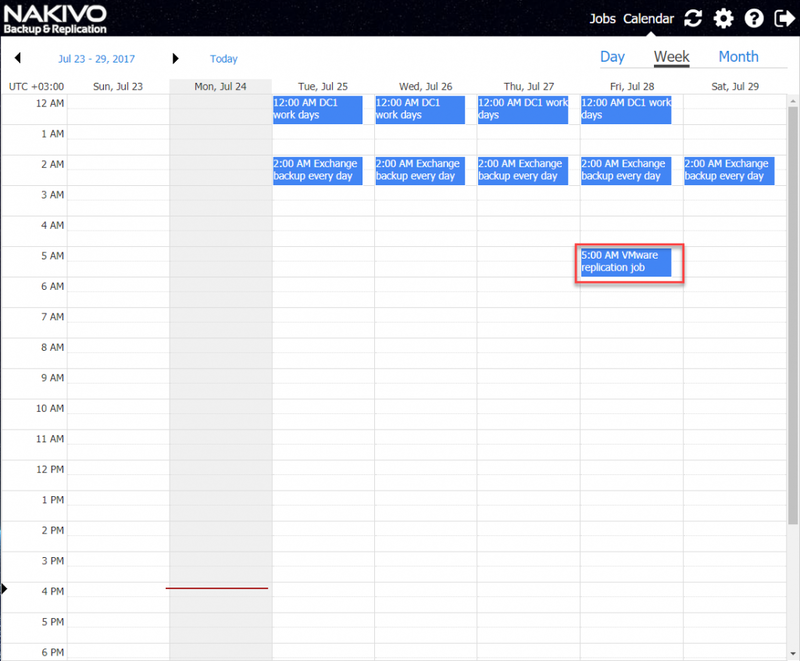 The Calendar Dashboard feature of NAKIVO Backup & Replication is a useful and easy-to-use tool for scheduling virtual machine backup and replication jobs. It displays all of your past, current, and future VM backup and replication jobs with their (predicted) duration. 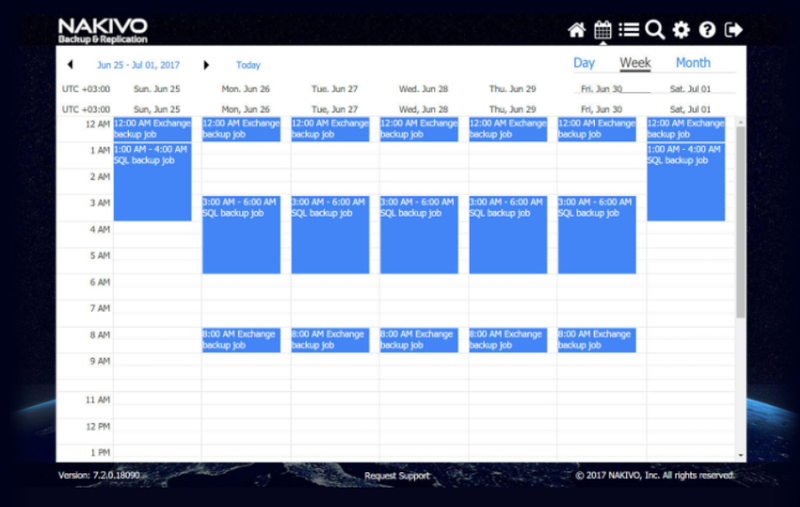 The Calendar Dashboard feature also enables managing any existing jobs, to create new jobs, and offers advanced job scheduling elements. Therefore, when it comes to large virtual environments, this feature is a must.